Old Man: I would tell you about how my wife and I met, but she died in a recent inexplicable forest fire because someone was playing with matches. And she couldn't be here today. So I'll read to you from the letters we wrote back and forth during the war and cry silent but brave tears. Harry Burns: I need to get to New York for the funeral of my first love, who died because she left some candles burning in her house made entirely out of silk curtains. Sally Albright: I'll give you a ride. I'm on my way to New York anyway to go to the funeral of my ex-boyfriend who died because he ate some poisonous mushrooms. Harry Burns: Life is so depressing. Sometimes I read the end of a book to see how it ends just in case I die. Sally: And I? Like to write letters to those who have died and then tie them to birds in hopes that they will carry them to heaven for me. Harry: That is touching and beautiful. But now I must marry another. Sally: I am saddened, but I can only hold my hand out in a manner of longing and scream "Harryyyyyyyyy!" as you drive off into the night. Old Woman: It is amazing that we are still together after all these years. Sally: Being single reminds me of the days when I had love in my life. Before he died in that romantically fatal boating accident. Marie: Before my married boyfriend died because his necktie was caught in that Kitchenaid mixer, I felt just like you. We won't be single forever. Sally: No one thought your married boyfriend could live through such a tragedy. Marie: You're right. You're right. I know you're right. 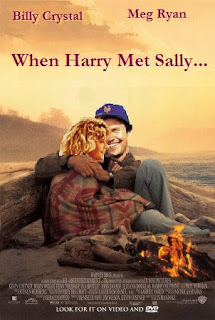 Harry: I've returned, Sally. I'm not married anymore. She drowned bobbing for apples. I told her that apple was too difficult to get. She didn't listen...she didn't listen. Sally: Okay, let's be in love then. 45 minute love montage including the following: having a picnic, running through a meadow, holding hands on a beach, kissing in a rainstorm, riding horses, wearing lightning rods as hats, brushing the teeth of rabid pit bulls, participating in a balance beam knife sharpening contest, walking down a dark alley wearing suits made of money, and eating large poorly chewed chunks of meat while not being trained in the Heimlich maneuver. Harry: This is the best love of my life. Can anything go wrong now? Harry: Then, I am going to go for a drive in my car with no headlights at night over by Certain Death Canyon. Sally: Boo hoo! Harry was my love. And now he is dead. Hilarious, but I won't go see it unless Jess dies after getting run down by a runaway wagon wheel coffee table. @AmRed: YES. How could I forget that coffee table? That stupid wagon wheel Roy Rogers garage sale coffee table? You said you liked it! Oh! Oh! You should totally do Casablanca next. @AmRed: I WAS BEING NICE!